We go on a date to a local place in Tacoma and try to spend no more than $20 total. This excludes tipping because a tip is dependent both on how much you spend and the quality of service. First up for this new season of Jack & Mimi’s Cheap Date is Taqueria Las Torres. Taqueria Las Torres is a Taco Truck connected to a small building on Tacoma’s 6th Ave. and Fife Street. Here’s a photo of the place. Mimi ordered the three taco meal with marinated pork and a Mandarin Orange Soda. I ordered the Enchilada plate and a Mexican Coke. Our total was $19.97. The dining area isn’t much more than you might expect in a cafeteria. It’s utilitarian rather than stylish. Televisions play whatever they’ve selected from Netflix. After a few minutes, our order was called out and we took our food back to our table. For food from what’s essentially a Taco Truck, it’s really not bad and fairly filling. Nothing was particularly spicy, though there’s a condiments area where you can add spice if that’s your thing. Mimi’s dish was more than a little hot by the time she was done preparing it. I ate mine with the provided plastic fork and knife. My enchilada was tasty and filling. Mimi said that the marinated pork taco plate as authentic and that the vegetables were very fresh. If you’re looking for a high class Mexican dining experience, this isn’t it. But you know that going in. If you’re looking for authentic, inexpensive Mexican food and friendly service, this is the place. 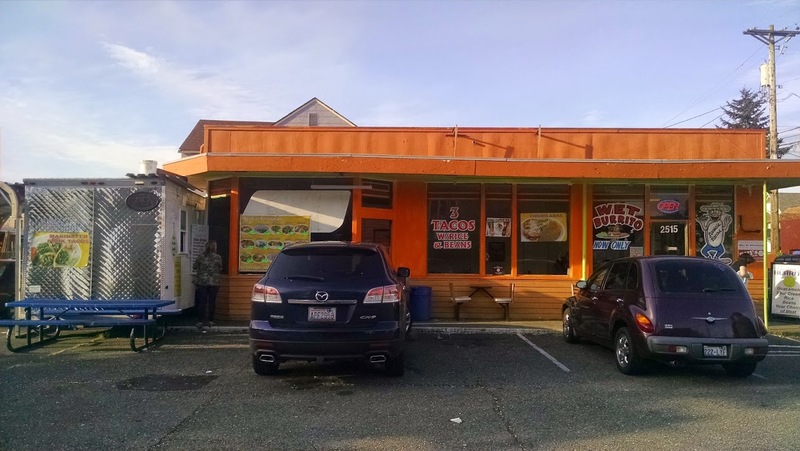 Taqueria Las Torres is located at 2516 6th Ave, Tacoma, WA 98406. This entry was posted in Jack & Mimi's Cheap Date and tagged Tacoma Restaurants, Taqueria Las Torres. Bookmark the permalink.